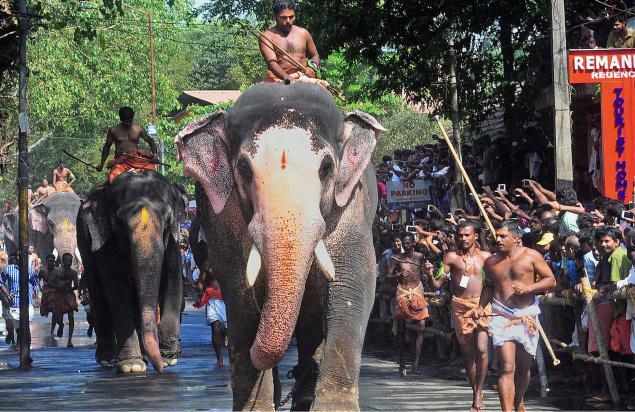 Guruvayoor Temple celebrated the beginning of annual festival with the famed Aanayottam (elephant race). Hundreds of people including tourists turned up to cheer the 29 elephants who took part in the race from Manjulal to the temple. The racing distance added up to half a kilometer approximately. Barricades were in place to control the public from venturing onto the track which had its finishing point in front of the deity Lord Sree Krishna inside the temple. Guruvayoor Devaswom’s Kesavankutty won the race comfortably beating Junior Vishnu and Nandini who finished second and third. This is the third consecutive win for the 65-year-old tusker. As the reward, Kesavankutty will lead the processions in this year’s annual festival at the temple. Elephant race is a yearly event at Guruvayoor Sree Krishna Temple in Trissur district of Kerala where the elephants owned by the temple administration (Devaswom) contest to decide which elephant will carry the coveted ‘Thidambu’ (The replica of the deity) during the festivities celebrating annual Guruvayoor Festival. Legend has it that one year the Kochi royal family refused to lend elephants for the temple rituals but at the time of the event, the elephants came running to the temple by themselves. It is to commemorate this unusual event, the elephant race (aanayottam) is conducted every year. It is a highly anticipated event among local people and tourists alike.